4Videosoft iPhone Contacts to Mac Transfer is a comprehensive software to transfer your iPhone Contacts to Mac and delete the unwanted contacts from the database. Also, it can transfer iPhone SMS and MMS to computer. It highly supports all Apple devices, latest iOS 5.1 and iTunes 10.6. And it supports all iPhone devices, including new iPhone 4S and new iPad. 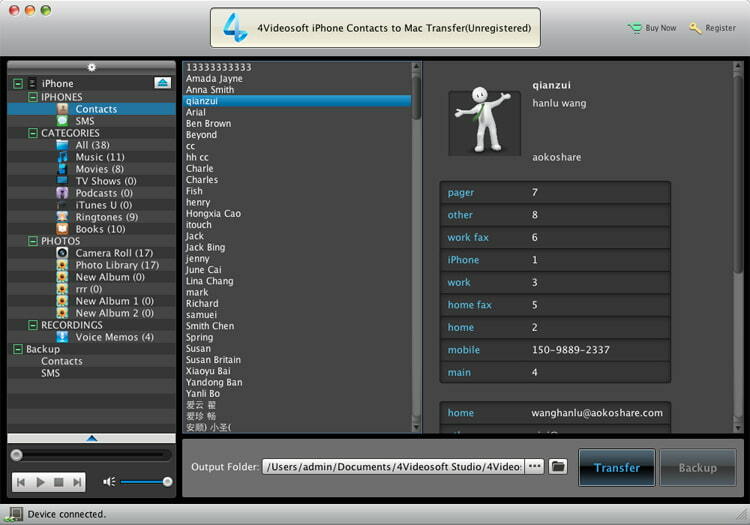 4Videosoft iPhone Contacts to Mac Transfer can transfer, backup, manage, delete iPhone contacts freely. It can also backup iPhone SMS(MMS) to computer. Connecting multiple Apple devices to Mac, 4Videosoft iPhone Contacts to Mac Transfer can help you transfer contacts between Apple devices. And it supports all iPhone versions (iPhone, iPhone 4, iPhone 4S) and other Apple devices. The iPhone Contacts to Mac Transfer can help you backup or delete all contacts or specific one(s). It highly supports latest iOS 5.1 and iTunes 10.6. And it supports four interface languages: English, French, Japanese and German.